What a difference a few months can make. Late last year, the Koreas were facing the very real prospect of a US-initiated war on the peninsula. Elements in the Trump administration, including noted Adult in the Room H.R. McMaster, were clearly laying the groundwork for military action against the North. This group was not yet a majority, but many feared that personnel shifts could cause the hawks to gain the upper hand, making war with North Korea a virtual certainty. Personnel changes did occur — and despite McMaster’s departure, they did not bode well for peace. McMaster was replaced as national security adviser by uber-hawk and George W. Bush administration alumnus John Bolton. And CIA director Mike Pompeo, known for yukking it up about the agency’s long history of regime change abroad, was promoted to secretary of state. It would not have been unreasonable to interpret these changes as the assembling of a war cabinet. Fast forward to today, though, and a new Korean War seems less likely than it has in years. The Olympic truce blossomed into a major diplomatic opening between North and South. The Koreas held a landmark summit at Panmunjom in late April — the first in eleven years and only the third in history — and issued a joint declaration that commits them to replacing the “unnatural armistice” with a “robust peace regime.” This big-picture thinking was paired with practical steps to reduce tensions, including establishing a joint liaison office in Kaesong (the site of a shared industrial complex), turning parts of the West Sea into a “maritime peace zone,” holding military-to-military talks, and ending propaganda broadcasts and leaflet distribution at the demilitarized zone. 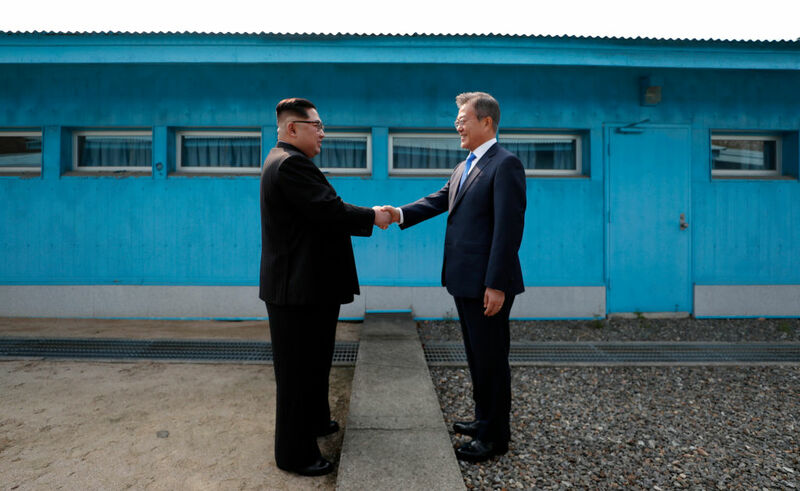 The declaration also contained a brief mention of inter-Korean development projects — namely, the creation of a shared rail system along the eastern part of the peninsula and another connecting Seoul with Sinuiju, a northern city on the border with China. Such plans dovetail with North Korean leader Kim Jong-un’s desire to open up his country to increased capital investment. Kim apparently looks to Vietnam’s Đổi Mới reforms in the 1980s as a potential model for marketization in the DPRK, which has quietly expanded under his reign. North Korea has never been the isolated “hermit kingdom” of pundit lore, but Kim Jong-un does seem to be seeking greater integration into the world system. These are major changes — and with four years left in his term, South Korean president Moon Jae-In will be around to help shepherd them to fruition. For obvious reasons, hope abounds on the peninsula. One poll found that 88 percent of South Koreans approve of the Panmunjom Declaration. Moon’s popularity, already high, has gone through the roof. South Korea’s conservatives, whose existence is defined by anticommunist opposition to the North, have been completely marginalized. The momentum is clearly behind inter-Korean reconciliation and a complete departure from the status quo. The question of denuclearization is still something of a wild card — but if ever there was a time for the US to go big, this would seem to be it. There are kernels of truth to all of these narratives. The DPRK is open to talks with the US in part because its intercontinental ballistic missile capability puts it in an extraordinarily good negotiating position. The latest joint declaration has some resemblance to the 2000 and 2007 statements. And yes, the Trump administration is made up of hard-liners — the most notorious of whom has publicly advocated talks because he believes they will fail, leaving military action the only remaining option. The chance of a return to “fire and fury” after the Trump-Kim meeting on June 12 should not be dismissed outright. But fears of an immediate shift toward war ignore the real achievements of the inter-Korean summit. Just as the Olympic detente suspended the rush to military action, the joint declaration buys more time for peace to prevail. It sets a firm date for North-South family reunions (August 15 — Liberation Day on the peninsula) and ends by noting that President Moon will visit Pyongyang in the fall. The groundwork for inter-Korean exchanges, from school field trips to reforestation initiatives, is already being laid. Moon and Kim have gained at least several months of sustained North-South engagement that the US will be hard-pressed to wreck, lest it endanger a military alliance essential to its position in Asia. A dramatic U-turn against Moon’s expressed opposition to war (and the South Korean public’s enthusiasm for diplomacy) could be catastrophic for relations between the two countries. The dilemma for the US, though, is that substantive peace would also pose a challenge to its strategic position. As Moon Chung-in, a special adviser to the Moon government, noted in Foreign Affairs last week, a peace treaty would open up the possibility of a US troop drawdown on the peninsula. The technical state of war, he observed, serves as the main justification for the continued US presence in South Korea. If the war officially ended, calls for troop reductions or even complete withdrawal could increase (though South Korea’s conservative party would oppose both possibilities). This is hardly a radical prediction. Yet Moon Chung-in’s comments — three sentences in an 1,800-word essay — were met with a minor furor, one compounded by a New York Times report soon after that Trump himself had instructed the Pentagon to develop plans for troop reductions. Moon Chung-in and the South Korean government quickly walked back his remarks — just as the Trump administration almost immediately denied the veracity of the Times report. At present this remains a completely hypothetical scenario, one dependent on a whole slew of positive developments. But the aghast reaction to Moon Chung-in’s comments belies the truth at their core: inter-Korean peace will be a game-changer for the US, with potentially far-reaching ramifications for its position in the region. Moon Jae-in’s presidency has been about maneuvering within the US-South Korea alliance to even out its power imbalances. Moon takes seriously the notion of “partnership” with the US — and it is difficult to deny that his government has used its considerable savviness to drag the Trump administration kicking and screaming into diplomacy with the North. Yet true partnership, as Moon Chung-in understands, will mean a reckoning for the United States. Will the US go along with the momentum towards lasting peace, even if that means undermining its own rationale for keeping troops stationed on the peninsula? Or will it act contrary to the wishes of its partner and reject diplomacy, endangering a critical alliance in the region? Only one of these paths will prevent a return to talk of military action. The US government seeks denuclearization, but the North’s weapons program cannot be disentangled from the state of war that exists on the Korean peninsula. The two issues are intimately related. So while recent developments are promising, it will be up to the global public to keep pressuring the Trump administration to pursue good-faith diplomacy with the DPRK. Otherwise we risk empowering Full Boltonism — and enabling a potentially disastrous war with nuclear implications.